This was a chapter break in the original edition (end of Chapter Two), but I’m not terribly impressed with whoever’s editorial decision that was. This is clearly not a break. Nephi’s switched from discussing his father’s reading of the Plates of Brass to discussing his own writing—but it’s not meant to be a substantive shift; rather, it’s mean to draw a continuity. I don’t know that Nephi’s being audacious in the same way that you or I (or a General Authority for that matter) might be being audacious if we declared our writings scripture. But he is being audacious in the sense that he sees himself as continuing the record. There are the Plates of Brass, there is the Book of Lehi, and here are Nephi’s writings, and they all fall into the same category. Being the new caretakers of this record, the obligation is clearly to continue it. And this sense of things continues, even amongst later record keepers who knew themselves to be unrighteous. And what ought one expect to be written in a record such as this? We’ve already seen that a major understanding of the Plates of Brass—and here Nephi obliquely informs us that Lehi took it up as well—is the recounting of one’s genealogy. Scripture is like a covenant—temporally extended, and something in which we ourselves our situated; and giving us an understanding of that situating is a major purpose for having scripture. I lament that Nephi didn’t include the genealogy. I’m fascinated by the idea. How would it have looked? What are the names? What could we learn from them? 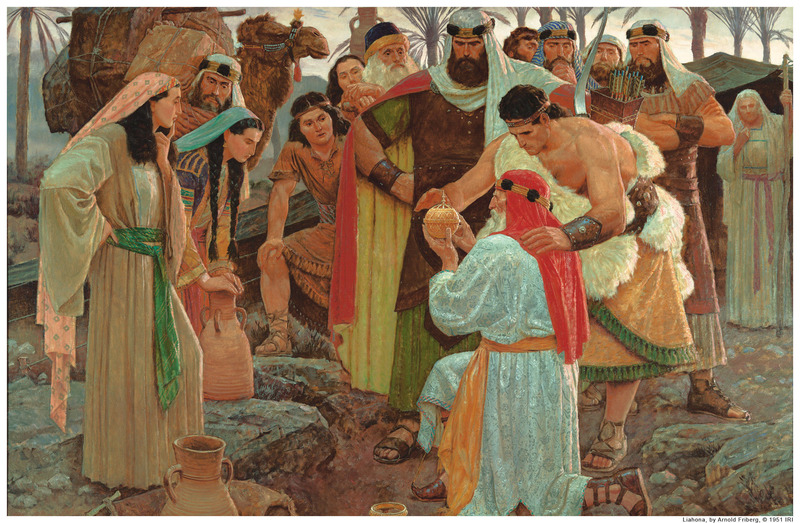 Were they continued—did they inform Nephite naming practices? Any surprises like there are in Christ’s genealogy? But Nephi—though he clearly feels the need to justify the decision—decided not to share this with us. I suspect he assumed they’d be available to us in the Plates of Brass (which Lehi has just prophesied would go to everyone) as well as his father’s record. What else? Here Nephi declares his main intention and motivation: to bring us to the God of Abraham, Isaac, and Jacob; to declare the things of God. I think one sees here as well the older, seasoned Nephi, a man who has long since grown comfortable with the role of theocratic leader among his people. Here is a man who doesn’t hesitate in the slightest to issue commands, not just to his people but to his posterity (i.e., his intended audience; at least at this point). And that final command is itself fascinating: don’t write things other than that which is of worth to humans in general. (The inherently relative nature of what is meant as a universal mandate aside.) Two thoughts: first, it’s a command that requires revelation and communion with the divine—there’s no other way to make sense of the command. One would could only know what was of such worth with their ear directly attuned to the Spirit. Second, it’s interesting to see here what Nephi jettisons as not meeting that criterion: genealogies. Clearly the Jews disagreed. As did his father, whose original motivation for retrieving the Plates of Brass was just that. Here is the first trace of Nephi’s convoluted, agonistic relationship to the Jews. Later he explicitly rejects significant portions of the culture and traditions and beliefs. Yet he holds dearly to their God, their covenant, and their promises—waiting to be grafted back in. Add to this the reinterpreted Messiah that soon becomes central to the narrative. We’re witnessing the birth of a new religion—the defining of continuity and distinction—that accompanies the birth of a new people. It’s probably a futile wish but I wish with the electronic version of the scriptures we’d have an option to not read in verse form and perhaps even display poetic structure better. Clark, I love the idea of the electronic version being able to toggle between the current verse-emphasis format and a more readable format. Have you seen Hardy’s reader’s edition? That’s the text I’ve been using this time through, and I really like it. He mimics recent biblical formatting conventions, including breaking things into prose vs. poetic verse. Of course one has often to make interpretive leaps in order to do so, but I think he does a fantastic job. Dave Parry did one for FARMS several years ago that is more geared towards the poetry. Hardy’s is good for that purpose, but I agree with Clark. I also saw a print edition with extremely wide margins for a lot of note taking. Unfortunately, I only saw it the one time and it was at church, not in a store. I was traveling and didn’t get a chance to ask where they’d purchased it.